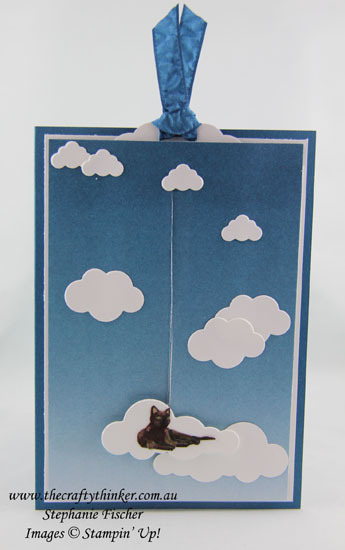 This card is part of the Crazy Crafters Project Highlights this week. Click here to see all the great cards and vote for your favourites. 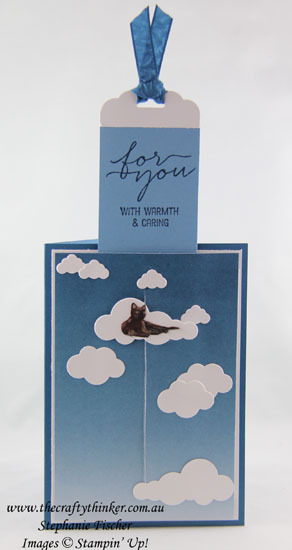 I made this for dear friends who have had to say goodbye to their much loved Tonkinese cat of 17 years. I think most of us know of the pain caused by farewelling our pets who become one of the family. This is one of those card designs that woke me up in the early hours - and, fortunately, I didn't forget it. I kept the card quite simple so that the cat, who I tried to make resemble Kahlua (can you guess the family favourite tipple of 17 years ago? ), would be the star of the show. The base card is Dapper Denim to which I added a layer of Whisper White. 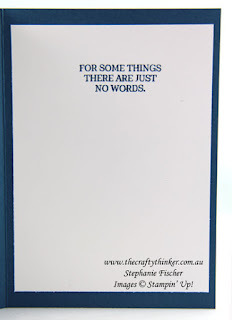 The top layer (with slider mechanism) is a piece of the new Colour Theory Designer Series Paper in Dapper Denim. The slider strip is Marina Mist with a top of Whisper White. The top is punched with the Scalloped Tag Topper. I made the "with warmth & caring" greeting from a stamp in the Flourishing Phrases set, with the judicious use of washi tape. Sadly, the Dapper Denim ribbon I used has just retired. The clouds are Whisper White, cut with dies from the Up & Away thinlit set. 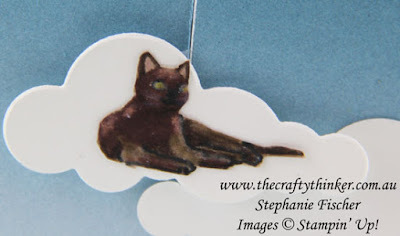 I stamped the cat from the Sitting Here stamp set with Crumb Cake ink onto Crumb Cake cardstock. I then adapted the image using Basic Black, Crumb Cake, Chocolate Chip, Powder Pink, Early Espresso Stampin' Write Markers. I then added some highlights with a little bit of Whisper White Craft Ink. For the eyes I used some Whisper White and then a little touch with the Lemon Lime Twist marker. Once coloured, I fussy cut the cat and adhered him to a cloud. 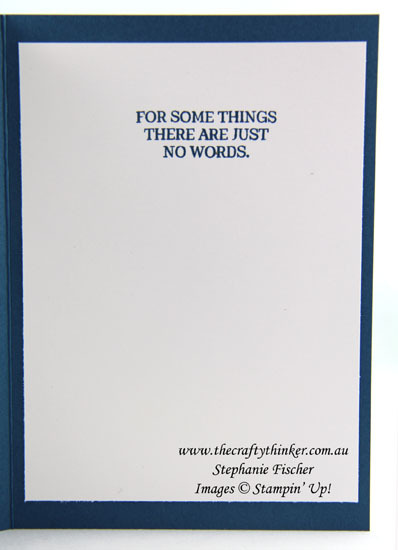 Sending more love and hugs to our friends - I do hope this dissertation on your card has not detracted from it.